Influencer marketing is about elevating your brand and creating exposure by leveraging the voice of others. But how do you get the most value from your influencer relationships? 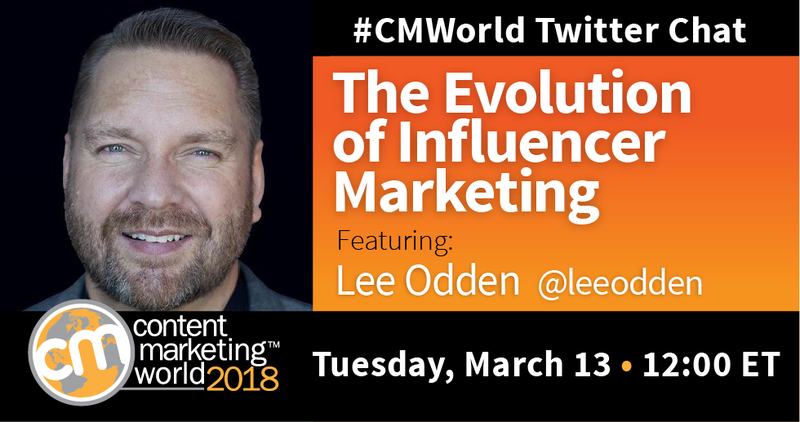 TopRank Marketing CEO Lee Odden helped our community break down the risks and rewards of working with influencers during a recent #CMWorld Twitter chat. What are the advantages of working with influencers and producing co-created content? A1: At the most basic level, collaborating with relevant influencers to co-create content that is promoted by those influencers helps brands connect with potential customers that are ignoring the brand’s advertising and salesy promotions. Beyond brand awareness and advocacy, how can influencers help improve leads and sales? This #CMWorld chat provided great discussion! Want to see more tweets from this chat? Check out our Twitter Moment. If you’re interested in learning more from Lee, he’ll be at Content Marketing World 2018! Register with code SM100 to save $100 at checkout.